Google reveals a suite of new Pixel products, prepared to be wow’ed! Things just keep heating up in the world of social media! News this week that we can now cross post our Insta Stories to Facebook is sure to shake up the world of dark social. While you can’t do the reverse, posting Facebook Stories to Instagram Stories, Facebook hasn’t ruled out building that in the future. 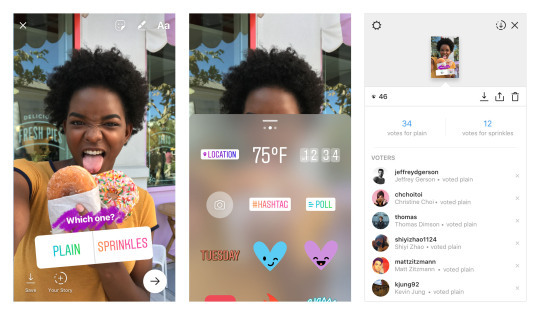 Instagram has added a new engagement feature to Stories. We can now a conducting polls. Not only that, we can make creative use of stickers with live results from your followers as they participate. Nice work Instagram! Jump over to @jsbgrams right now to see my poll on Stories. It was a really big week for Google as it revealed a series of second generation products known as Pixel, at a launch event in San Francisco. Here’s the shopping list of what was unveiled by company CEO Sundar Pichai. A pair of wireless earbuds that can translate a conversation in real-time. What’s the common denominator for all these products? They all connect to Google Assistant, the artificial intelligent helper! In today’s show I interview Derek O’Neill, Global Security Lead at Nitro Software. I caught up with Derek at their offices in Dublin and I asked him about GDPR and the implications for organisations of all sizes. Derek is also a member of the Information Systems Audit and Control Association and former chair of the Irish Information Security Forum. Q1: The EU General Data Protection Regulation (GDPR) is the most important change in data privacy regulation in 20 years What is GDPR in simple terms? It is the EU’s (European Commission) attempt to unify data protection within the EU through a single law – the General Data Protection Regulation (GDPR). A single EU wide law, applicable to all 28 member states, which aims to build trust within the region and bring data protection up to date in light of new technological developments such as cloud, social and mobile. Before GDPR, European countries had different approaches and interpretations to data protection making it difficult to demonstrate compliance – leading to confusion. The hope is that a single harmonized Data Protection Regulation will go a long way to resolve these issues, making it easier for companies and increased confidence for citizen. Q2: Why has it been introduced? The European Parliament, the Council of the European Union and the European Commission intend to strengthen and unify data protection for all individuals within the European Union (EU). It also addresses the export of personal data outside the EU. Q3: What constitutes personal data? Q4: In digital marketing, we rely on the personal data collected from different devices to build buyer personas, create tailor-made customer journeys and provide a personalised customer experience. How will GDPR affect how we currently do business? It will affect how businesses do business, and in theory, it should make the experience for customers “better” in that they will have more clearly defined rights & expectations. For businesses, the way personal data is collected will have to be considered in the context of Privacy by Design & by Default. Data protection by Design and by Default (Article 25) requires that data protection is designed into the development of business processes for products and services. This requires that privacy settings must be set at a high level by default, and that technical and procedural measures should be taken care by the controller in order to make sure that the processing, throughout the whole processing lifecycle, complies with the regulation. For customers it will enforce “rights” that people always had to an extent. Q5: If anyone is any doubt as to the importance of GDPR, then they should perhaps be reminded of recent US financial services example where customer data was lost. Tell us about that. Well, you’re probably thinking of Equifax there, where almost half of all US citizens were involved in a data breach that covered names, addresses, social security numbers and in some cases credit card numbers and other personal, financial details. All told 143 Million people involved. Not the BIGGEST hack ever… that would be 1 Billion Yahoo records between 2014 and 2016, but certainly the most sensitive big breach in recent times. I suppose the first thing to say is the data wasn’t lost – it was stolen, and when it was discovered it was handled badly. The breach was made possible because core software wasn’t kept patched or updated and known flaws in the software were exploited by hackers; we haven’t seen the real fallout yet, but it’s likely to be significant. Already, several C level executives have “retired”, including the Chief Information Officer and Chief Security Officer. A bunch (at least 25) of class action suits have been taken on behalf of US citizens, congressional investigations will follow and probably more lawsuits. According to respected US technology lawyer Mark Grossman, It’s a real possibility that Equifax will NOT the fallout from this breach. Q6: What are the penalties for breach of the GDPR? Q7: As we continue to harvest data in the Digital Age, do you think there will be any more intelligent ways to safeguard against loss or theft of data? Will artificial intelligence play any role? There’s no silver bullet here. AI on it’s own will not help. In the case of Equifax, the root cause was a failure to apply good practice and maintain software currency. In other words, they didn’t apply software patches. It’s not rocket science… for years IT people have known that patching, patching and patching are essential to good Information Security practices. So before we think about high tech AI solutions, we need to understand why patching is not applied. Everyone knows it is best practice, but some very large & successful organisations clearly don’t do it. Q8: What advice would you give to companies and organisations who haven’t made any plans to prepare for the introduction of GDPR in May 2018. What do they need to do? Well, if you deal in personal data, or your business handles personal data of customers you need to be sure that you can observe the law. That’s what it boils down to. GDPR will become law in less than 240 days, so the sooner you prepare, the better prepared you will be. Larger organisations which have Privacy staff, or InfoSec staff will be better placed, and should already be planning & preparing for May 2018. My advice would be for anyone who is interested to take a look at the IBEC Guides on GDPR – I’m not affiliated, but I have read these guides and they strike me as clear & straightforward advice. Q9: There is a 2-year post-adoption grace period, before the GDPR will become fully enforceable throughout the European Union, can companies view this as extra time to prepare for it? Let’s be very clear on this, GDPR is in force right now. Officially, the regulation entered into force 20 days after its publication in the Official Journal of the European Union on 4 May 2016. Its provisions will be directly applicable in all member states two years after this date. So, there is no more grace period. We are approaching the date when the existing GDPR law becomes enforceable. 240 days including weekends and bank holidays. Q10: The ‘right to be forgotten’ is part of the GDPR legislation, will this have a major bearing for search engines and social networks? Google, for example, offer you the ability to manage your account with them, and delete certain data. Social networks also offer varying levels of “forgetfulness”. It’s important to remember that GDPR allows for obligations of the “Controller” where the legitimate interests of the controller is overridden by the interests or fundamental rights and freedoms of the data subject which require protection of personal data. There is a constant tension between the ability to do increasing amounts of business online and the right to privacy, with consumer data being properly safeguarded. GDPR attempts to define where that balance should be, identifying a number of rights for citizens and a number of responsibilities that organisations must adhere to. No silver bullet and it’s not a once off either. This is a fundamental change to how PII is managed from this point on. But this week I’m sharing three frequently asked questions about GDPR. 1. When is GDPR coming into effect? The GDPR was approved and adopted by the EU Parliament in April 2016. The regulation takes next May 2018. 2. In light of an uncertain ‘Brexit’, should UK Data Protection Officers still continue with GDPR planning and preparation? If you process data about individuals in the context of selling goods or services to citizens in other EU countries then you will need to comply with the GDPR, irrespective as to whether or not you the UK retains the GDPR post-Brexit. If your activities are limited to the UK, then the position (after the initial exit period) is much less clear. The UK Government has indicated it will implement an equivalent or alternative legal mechanisms. In today’s column, I discuss how to collect digital data with data protection in mind. Data is the currency of digital marketers. But in a more data-conscious world we need to be mindful of how we collect and use customer and stakeholder information. Another way to protect customer privacy when you collect information is to use security mechanisms such as SSL. SSL means that the connection between your website and the user’s browser is secure when data is transmitted. Ensure that any websites you use with your customers have SSL enabled. It’s good practice to use service provides in your own jurisdiction because the data privacy laws are so varied worldwide. With this episode of JSB Talks Digital being about privacy, it’s appropriate that the social media tool that saved my working week helps me stay safe online while on the move. NordVPN is a provider of a Virtual Private Network which gives you privacy while surfing online using publicly available wifi. Did you know that you can’t be safe online without a VPN? I invested 3.29 per month for two years for the service! It’s a steal – check out their features and their special offer now at nordvpn.com. And I don’t have an affiliate with this company. Simply a JSB recommendation.